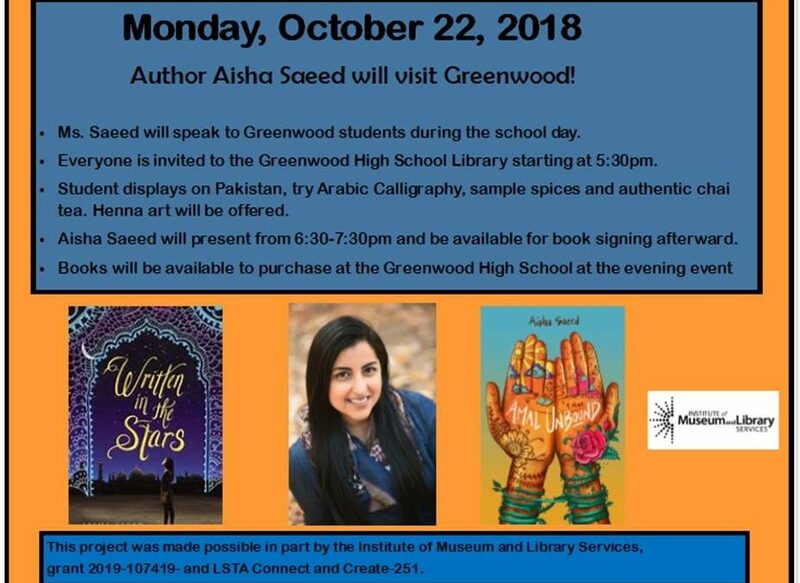 Author Aisha Saeed will visit Greenwood on Monday, October 22, 2018, to speak about her book, her heritage, and her experiences as a writer. Ms. Saeed will speak to students in grades 3-6 at the elementary school and grades 7-8 at the high school. A presentation open to the general public will be held at the high school library at 6:30 p.m., 306 West Central Ave. in Greenwood. Books will be available for checkout and purchase at the Greenwood Public Library, 102 N. Main St. in Greenwood. Through exploration of the Pakistani culture, participants at the schools and public library can try their hand at Arabic calligraphy and taste spices and authentic chai tea. Henna art will be offered. Ms. Sneed is the author of “Amal Unbound” (Nancy Paulsen Books, 2018). “Amal Unbound” is a 2018 Global Read Aloud Selection and has several starred reviews.